As a long-time admirer of Jerry’s website (not to mention his other activities), I’m happy to have a chance to contribute to it. And I hope this will be a worthwhile contribution: in this space, for the next several Saturdays, I’m going to be concentrating on the nontheatrical films of Walt Disney. 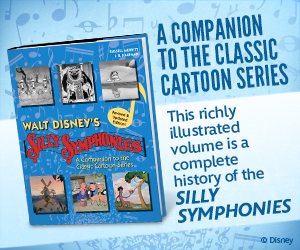 We focus a lot of attention—as we should—on the classic Disney theatrical cartoons, short and feature-length. But at the same time there’s an alternate universe of Disney animation: the educational and public-service films, intended for showing in classrooms and other alternative venues. Here the well-known Disney mastery of animation and storytelling was harnessed in the service of health, educational, or public-service causes. The relative obscurity of these films makes them doubly fascinating to me, and, I hope, to some of you as well. One of the things I like about Cartoon Research is that some of its contributors give their posts an intimate touch by sharing their personal stories. Here’s a bit of mine. When I was a child, I fell so deeply in love with the movies that I even enjoyed the 16mm educational films that were shown to us in school. Of course I recognized that some of them were better than others; of course I could see that this experience was nothing like watching the latest Disney release in a theater. But at some level, those things seemed relatively unimportant to me. These were movies! I was watching a motion picture projected on a screen, and that in itself was something to be savored. On certain rare occasions, the film being shown to my class actually was a Disney production—and on those occasions, my joy knew no bounds. 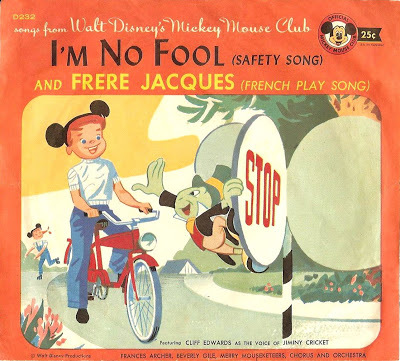 I have a vivid memory of a fifth-grade assembly in which we were shown two of the I’m No Fool cartoons, featuring Jiminy Cricket. These films had been produced a few years earlier for the Mickey Mouse Club TV show, and so had been widely seen in black and white; but the studio had cannily produced them in color editions so they could also be circulated on 16mm to schools like mine. I didn’t know at the time that one of the two films was the very first one in the series, broadcast during the first week of the Mickey Mouse Club in October 1955. Still less did I suspect that decades later—while researching Jiminy Cricket background for my Pinocchio book—I would have the opportunity to learn extensive details about the making of this little gem. The story behind this film begins early in 1955, when the Disney studio was assembling material for the Mickey Mouse Club series. 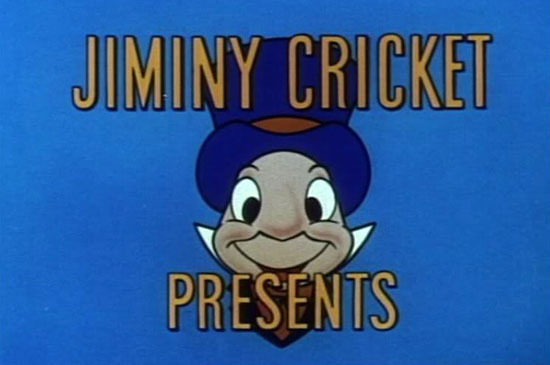 Walt Disney had intended from the beginning that the program should include a segment on safety, and Jiminy Cricket, Pinocchio’s erstwhile guide, was a natural choice to host such a segment. In March 1955 the safety miniseries was christened I’m No Fool, and Jimmie Dodd, the program’s multitalented front man, composed a catchy title song for the Cricket to sing. Direction of the series was assigned to veteran Disney artist Bill Justice, and the story crew consisted of Nick George (another name familiar to Disney animation fans for his years as assistant to Norm Ferguson) and Bill Berg. The first entry, focusing on bicycle safety, established the convention that would be repeated in the rest of the series. This was essentially a formula that had served Walt well since the making of his dental-care film, Tommy Tucker’s Tooth, in 1922: a “good” character who does something properly, contrasted with another character whose bad example is played for laughs. The crew worked quickly to develop this story material, and by May 1955 the animators were at work on the first film. The greatest challenge faced by TV animation producers was turning out their work fast enough to meet the demanding schedule of daily television. The Disney TV cartoons continued to maintain a visual standard that was luxurious compared to that of other producers, but the Disney artists, too, resorted to shortcuts and tricks. 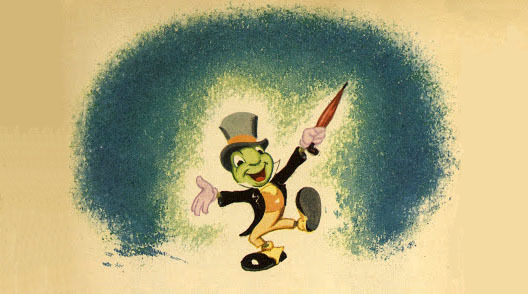 Jiminy Cricket in I’m No Fool is unquestionably the same character who had appeared in Pinocchio, complete with the warm, folksy voice of Cliff Edwards, but his design is stylized. His facial features are simplified in order to read well on the small screen, and he’s inked with a heavy black outline. In the color version, the subtle gradations of his skin tone in Pinocchio are replaced by a light salmon—a color choice that made a great impression on me as a child. The first picture inaugurates the format that will be used in the rest of the I’m No Fool pictures. 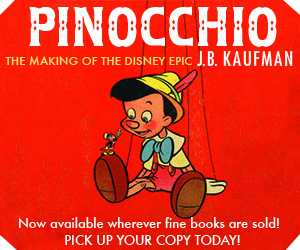 Jiminy Cricket, comfortably ensconced in a library (another echo of Pinocchio), sings the jaunty title song and talks to his young audience about the importance of safety. With the help of animated book illustrations, he outlines a brief history of the bicycle. Then he draws two characters on a blackboard: “you”—a small boy representing the viewer—and “a common ordinary fool” who will demonstrate the wrong things to do. The rest of the picture entertainingly illustrates the do’s and don’ts of bicycle safety, the Cricket applauding the conscientious efforts of “you” and addressing the “fool” in language that would never get by in today’s hypersensitive culture (“Try it again, stupid!”). Of course this bicycle short was only the beginning; the series continued with entries on fire, pedestrian, swimming, and electrical safety. Anyone who has seen more than one of these cartoons knows that the opening and closing scenes, as well as some snippets of animation in between, are reused in each new picture. To some viewers this may seem like a cheat; to my fifth-grade eye it was wonderful. I loved any kind of glimpse behind the scenes, and marveled that scenes from one film could be integrated with new scenes to produce a brand-new film. Whatever one’s point of view, it’s clear that the I’m No Fool series was produced with a great deal of ingenuity. Besides the recycled scenes and the simplified character design, additional devices helped to streamline the production process still further. During the historical sequence, the Cricket points out images which come to life in modest, limited-animation movement—but this seems appropriate, given that they’re supposed to be book illustrations. His chalk drawings of “you” and the “fool” on a blackboard are extremely simple line drawings, reducing any animation challenges to a minimum. In this way the production team held down costs of the I’m No Fool series without sacrificing the quality that viewers expected of a Disney production. And, in any case, the studio’s basic objective was achieved: a cheerful little series of cartoons that kept a generation of young viewers entertained while they absorbed important safety lessons. I can vouch for at least one who did! 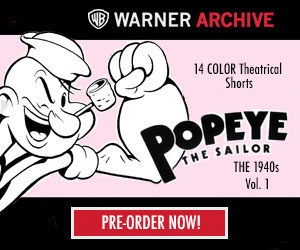 I remember seeing these shorts on the old Disney Channel in the eighties. Ah, memories. I’m sure I’ve said this before, but I still miss the OLD Disney Channel myself. They also were part of the 1970’s revival of the Mickey Mouse Club. It’s wonderful to have JB writing here on a regular basis and can’t wait for his next contribution. Anyone familiar with this product (or this site)? It was no secret among folks my age that the Disney educational 16mm films were infinitely superior to anything anyone else was doing in the field. Admittedly the competition (Coronet, EB Films, etc.) wasn’t exactly fearsome. The most frustrating thing about them was that, thanks to their popularity, the first few minutes were invariably spliced and respliced into gibberish because the creaky school projectors (and the mechanically challenged teachers operating them) chopped them to ribbons. Yes, we had a history teacher at my high school who wasn’t allowed by the library staff (all films were serviced through the library) to go near a film projector. Someone always had to be assigned to run films for her. They referred to her in that regard as “The Shredder.” That woman probably ruined more 16mm film than just about anybody else around. I never could figure out what the problem was. Maybe it’s because I’ve been dealing with them for most of my life, but frankly, threading and operating a 16mm projector isn’t exactly rocket science. The schools I went to weren’t any better. The films always had broken sprockets for those first few minutes and very often they were spliced together with scotch tape as they didn’t have a proper tape splicer handy. When I was in first grade, the teachers and trusted me to thread and run the projectors. That was when projectors need to be manually threaded. Limited animation doesn’t have to mean animation done cheaply or without integrity. Yes, it’s a way of saving money, but if it is planned out correctly can be every bit as entertaining and visually enjoyable as full animation…in some cases even more so. Bill Justice was given the task of exploring cheaper ways of doing animation at the Disney studio, hence his experiments with this series, Stop Motion with Noah’s Ark and his work with cut out animation with the titles of Parent Trap, The Shaggy Dog, Merlin Jones and the mixed media experience of Symposium Of Popular Songs. Bill Justice’s work on all these projects (The Mickey Mouse Club Opening as well) exhibit a joy that represents the heart of Disney. I remember Jiminy having similar songs titled “Encyclopedia” and “You are a Human Animal.” Don’t remember if the actual segments were primarily animation or live action. Hoping you’ll be covering some of the Disneyland/World of Color animated episodes, especially the ones with Ludwig Von Drake. They were mainly clip shows, but the new connecting scenes were often substantial. Those were separate entries themselves. I remember “You Are A Human Animal” very well. By the way, I know that “You Are A Human Animal” is in animation. Not sure about the other one, though. Great job, J.B., and thanks for hosting this new series, Jerry. I’m spreading the word on The Friends of The Walt Disney Family Museum group page on Facebook. I remember so many of these from the mid- to late 1960s playing in our classrooms. It was also nice to learn many years later just how important the work was to Cliff Edwards. Great stuff! I too remember when our classes were shown a Disney educational movie we knew it was going to be good. The ones with Jiminy Cricket were (and still are) a special treat. Thanks! PS – the recent “Legacy Collection” edition of the soundtrack to “Pinocchio” contains “I’m No Fool” and “You Are A Human Animal” as extras. PPS – really looking forward to your book J.B. – I pre-ordered it months ago! I was first exposed to the “I’m No Fool” shorts in primary school 40+ years ago. Sixty years ago(! ), my parents gave their ten-year-old a quarter to buy that “I’m No Fool” Mickey Mouse Club record shown above! I still have it, carefully preserved in my collection of children’s records, which includes many other Mickey Mouse Club 78 rpm records (including the ten-inch size that sold for 98 cents). The film I remember from the Disney classroom projects was a longer one called “The ABC of Hand Tools,” starring a then-new caveman character called Primitive Pete! Years later, I discovered the booklet containing the text of the film’s soundtrack–and more recently, I have added a print of it to my 16mm film collection! Been happy as the proverbial clam ever since! Mr. Kaufman, your childhood studying of how the “I’m No Fool” series was produced is an echo of my own childhood mindset. In the early 1950s, I was watching NBC’s classic kid show HOWDY DOODY. In those days, when the show was live, it always ended for the day with a cuckoo clock just before the show ended. (This was a secret time signal to the cast and crew to stop the story and wrap the show!) At that point, many kids across the country turned the set off and went to supper as soon as they saw and heard the cuckoo. Not I! I stayed tuned! On days when they weren’t running late, the cuckoo would be followed by the credits. Each time they were run, I read the cast list and the crew credits until I had the names memorized! Why? Because even at that young age, I wanted to know who the people were who were working on camera and behind the scenes to give me all the pleasure that that show provided to me! (Decades later, thanks to the one-and-only Howdy Doody collectors’ club conventions, I was face to face with several of these people, including Buffalo Bob and the executive producer!) :-)! Thanks for this long-awaited article on that little-known facet of the Disney Studio that deserves to be mentioned. While I can’t remember what was the first “I’m No Fool” short I saw, I do recall seeing the bicycle film once in the school gym, possibly before Winter break as they always had an excuse to entertain kids just before leaving until the next semester. These films also saw renewed life in the 1980’s courtesy of The Disney Channel during the half-hour “Donald Duck Presents” program. Watching them there was probably the first I ever saw these (or on Mickey Mouse Club reruns). The rest of the picture entertainingly illustrates the do’s and don’ts of bicycle safety, the Cricket applauding the conscientious efforts of “you” and addressing the “fool” in language that would never get by in today’s hypersensitive culture (“Try it again, stupid!”). Funny to think I use to go along with these! I certainly learned a great deal not to be a “fool” by examples given in these films. We certainly didn’t overlook the details at first glance, but I do remember thinking, “Yeah, here comes the You vs. Fool bit!” when those scenes showed up. Of course in the “You and your ____” shorts it would be the bit of Jiminy coming to a row of books that was always shown with all those silly book titles like “How To Yell Like An Indian”. And, in any case, the studio’s basic objective was achieved: a cheerful little series of cartoons that kept a generation of young viewers entertained while they absorbed important safety lessons. I can vouch for at least one who did! And while true these films lasted as long as they did school-wise, it didn’t stop Disney from revising certain ones to suit whatever need they needed to address later on. I noticed one version of “I’m No Fool with Fire” released in the 80’s had needless editing done to remove the last half of the film, plus add in some live-action bit where a fireman instructs two kids on proper fire safety procedures. Not that bad but it was a shame to lose the You vs. Fool bit. Sometimes they can get confusion which version you saw as well, as I noticed there were different versions of the “You and Your” series done in the 80’s that was not the same as the MMC version we know by heart yet they retain those titles. Speaking of revised editions, the “I’m No Fool with Electricity” always stuck out a bit for me given the slightly different voice Jiminy had, and the way it was animated. I see looking at this clip that it was done in 1973, and directed by Les Clark who was doing many educational shorts for Disney during his final years (also the only short to have production credits shown at the end). The reason Jiminy’s voice sounded different is that it was not Cliff Edwards! Cliff died in the summer of 1971, aged 76. I remember these from kindergarten. They were shown to us after recess as a treat. I appreciate all of the information. I learned more about these films today than I ever knew before. Cliff Edwards as Jiminy Cricket exuded a lot of personality and warmth. He really felt like an old friend. It looked like a piece of the film was missing, right around the “53” chorus. I met Bill Justice in Boston in the 80s – he went on a tour of department stores, gave a little presentation of his days in the animation biz, and handed out drawings he made on hotel stationery (mine’s the Mad Hatter). JB, thanks both for a great start to what looks to be wonderful series of articles, and for hosting the screening of Pinocchio at the Academy Theater in NYC yesterday morning. It was a thrill to see the movie on the big screen for the first time, and to hear the reactions of the audience, young and old, who appreciate the timeless appeal of the film. I, too, grew up watching the I’m No Fool series on The Disney Channel of the 80s (oh, how I wish I had kept my copies of The Disney Channel magazine and even the old Disney Store catalogs!). That clever title song gets stuck in my head for days. And I’m pretty sure I saw a few of these films played in grade school, too. Disney educational films were always a treat, as they were better than the standard films and film strips. One of my favorite memories was pre-VHS era surprise: in first grade, the day before Christmas break, the entire student body watched The Apple Dumpling Gang projected in the church hall (I went to Catholic grade school). I remember the thrill that my school could show the Disney movies I loved to watch, and how much laughter there was from an audience of kids. I recall seeing a few other Disney films this way like “Old Yeller”, “Bedknobs & Broomsticks”, “The Aristocats” and “No Deposit, No Return”. Those were fun times, especially since they had to get two projectors for these things and had to be on the standby to turn one of while turning another on when it got to the end of a reel! When I was in first or second grade, my class got to see Follow Me Boys on the last day before Christmas break. It actually was a B & W print; I didn’t know it was a Tecnicolor film until it aired on the Disney Channel over a decade later. That was cool. My school did something like that, but you had to turn in Campbell’s Soup labels to see whatever films they could rent and show in the gym. Great idea for a series! Looking forward to more installments! Love these films! Am old enough (alas!) to have seen four Jiminy Cricket series ( I’M NO FOOL, ENCYCLOPEDIA, THE NATURE OF THINGS and YOU) first run on original MM Club. One of the neat thing about the wide educational distribution of these cartoons was their ready availability for collectors of 16mm films. Young collectors could snag these quality Disney toons, usually at a fraction of the cost of regular theatrical titles. As noted, some prints could be pretty beat after schoolhouse use, but many were in okay to fine condition and, back in the day, the stigma of being ‘educational films’ could severely reduce their value in the eyes of big collectors, adjusting the prices accordingly. And many prints were beautiful Technicolor ones! Unfortunately, as also noted, Disney’s educational division apparently revised the films in the 80’s, adding clumsy new live action footage, editing out such terrific stuff as the ‘Fool’ half of the I’M NO FOOL films. Adding insult to injury, these versions were video transfers, so the picture resolution was pretty crummy. Yes, the NATURE OF THINGS films originally featured some live action scenes but those were well selected and, unlike the newer editions, never talked down to the intended audience. Happily for old die-hard 16mm enthusiasts like yours truly, many of those original versions still occasionally pop up on eBay. Also happily, many sellers have little interest in old time grade school movies. Nabbed one last year for less than ten bucks! Outstanding article on a well remembered (but under scrutinized) series of Disney educational films. Like JB Kaufman, I fondly recall seeing these in school. I agree — it was somehow always a treat when the teacher occasionally wheeled in the 16mm projector to show a film in class. That the picture the instructor racked up sometimes turned out to be dull and pedantic was almost irrelevant; it was such a novelty to sit in a classroom and watch a movie… in school! The Disney films — the “I’m No Fool” shorts, “How to Catch a Cold” (produced for Kleenex!) and “A World is Born” (FANTASIA’s “Rite of Spring” sequence as a narrated science lecture) — were probably most warmly received, as was the Capra-produced Bell Science series. I also attended Saturday’s New York screening of PINOCCHIO. It was wonderful to see this on the big screen again. I only wish that time had allowed for JB’s remarks about the film to be more extensive. I am eagerly awaiting his new book. It always got a big laugh from my 5th grade class when Jiminy’s umbrella pointed (surprise) straight at US! This was in the early 70’s, and we had no idea these films were from the “Happy Days” era. I think the ingenious use of limited animation, as elaborated on in previous posts, really gave it a casual friendliness that seemed so refreshingly “new”. Combined with the deep warmth and delight of the musical score, it all was just irresistible. This was around the time I realized how much I wanted to make educational cartoons someday (thanks also to the Bell Science series). Every now and then, I get to!